Believable camouflage is all about finding the right palette! Introducing the Maybelline Facestudio Master Camo? 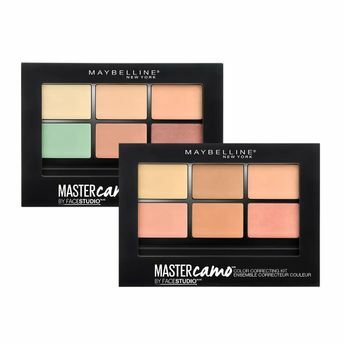 Color Correcting all-in-one palette that helps you achieve smooth, flawless complexion in a minute. This Color Correcting Kit takes the guesswork out of color correcting. Curated by skin tone; now correct, conceal, and highlight for the insta-perfect canvas. Three simple steps to a perfected complexion: color correct, conceal, and reveal. Helps neutralize skin tone issues, conceal imperfections and under eye circles, and brighten facial features. Duo brush is included for easy application and blending. Palette shade: Light (for fair skin) : Corrects Redness & Dark Circles. Palette shade: Medium (for medium to dark skin) : Corrects Dullness & Dark Circles.